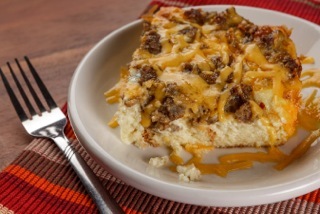 A quick and easy way to put together a delicious breakfast, this casserole features Carolina Pride roll sausage—use mild or hot depending on your heat preference. 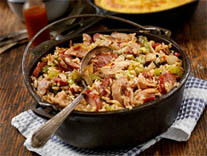 Put bread, sausage and cheese in buttered 11x7-inch casserole dish. Beat together eggs and milk and pour over other ingredients. Cover with plastic wrap and let set in refrigerator for 24 hours. Cook for 45 minutes at 350 degrees F. Serve hot.